US brand Pivot has had a UK trail bike shaped gap in its range for a while now, but the release of their all new Mach 5.5 fills that with a carbon fibre framed machine sporting 140mm of travel out back matched to 160mm up front. Slotting into the range between the light'n'fast, big wheeled 429 and the hard-hitting, longer travel Switchblade and Firebird, it's safe to assume the aging Mach 6 is getting dropped in favour of this new bike. The Mach 5.5 definitely sports much more modern geometry, with a much greater reach – 460mm for a size Large – for greater stability at speed. Elsewhere the numbers are pretty much on the money for a current generation trail bike, with a 66.5º head angle and a 73.5º seat angle. Yes, there are other bikes in this category that push the boat further out in terms of how long and slack they go, but Pivot has always been a naturally conservative brand when it comes to shape, even if they aren't when it comes to design features. 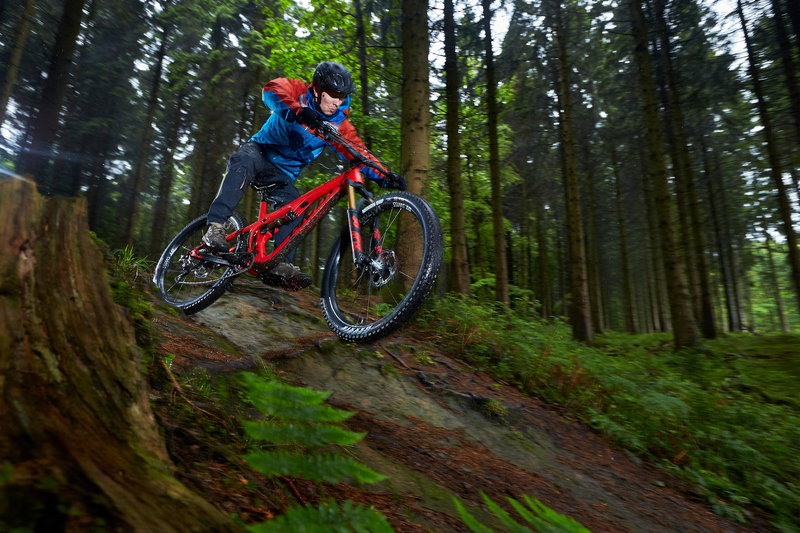 Pivot held fire on developing the new bike before seeing where the tumultuous wheel and tyre 'standard' chopping and changing of the mountain bike world would finally end up. The new bike splits the difference between normal 27.5” wheels and the 27 Plus standard of 2.8-3.0” tyres on extra fat rims with a 40-45mmm internal diameter. It's designed to be run with 27.5” rims with a 35mm width and the new crop of 2.6” tyres. That's something you should expect to see from a number of brands, as it offers additional grip over a standard tyre without running into the weight, durability and sizing issues of a proper Plus setup. It also means it's backwards compatible with 'normal' 27.5” setups running tyres anywhere from 2.0” onwards without screwing up the geometry too much, making a frame-only build with older parts a reasonable prospect, though the hub spacing at the back is still Boost 148. Top-of-the-range models get a special carbon fibre wheelset from Reynolds that will be exclusive to Pivot Mach 5.5 complete builds for the next six months. With a 36mm internal width, it uses a special mix of high end carbon fibres that are said to be tougher and lighter paired to Industry Nine hubs, though that was all the detail on offer. The main man at Pivot, Chris Cocalis, has always enjoyed a close relationship with Shimano and has helped develop a number of products with them over the years, including the somewhat contentious Press Fit 92 bottom bracket standard. He's also worked closely with Fox Racing Shox. Those two brands together form a development counterpoint to the SRAM/ RockShox drivetrain and suspension hegemony, so it's little suprise to see them pairing up on many projects, with Pivot's own bikes being very much at the forefront. That means that this bike is setup to run Shimano's electric Di2 groupsets, with neat battery storage in the bottom bracket area and very clean routing for both electric and standard cables. It's safe to assume that this relationship with Shimano is probably part of the reason why the bike is still designed to run a double or triple chainring up front, despite the (SRAM led) single-ring drivetrain revolution offering a number of advantages to any frame designer pushed for space and looking to maximise stiffness. Every bike in the range comes with Fox suspension, though there are SRAM drivetrain-equipped builds available. Of interest to tech geeks is the large, blanked off space in front of the upper rear shock mount. Though Fox are still cagey about the release date of their Live Valve system, it's pretty safe to say that this is where it will fit when it's finally ready for the public. The system is designed to automatically adjust suspension damper settings in real time, adapting to the terrain as you ride. While similar systems like this already exist, such as the Accel Group/SRAM developed E:I system, they only work fast enough to adjust the rear shock when feedback is passed from the fork striking a bump, while Live Valve is said to be able to react fast enough to be effective on both shocks. Based on their previous partnership between Fox and Shimano on the iCD electronic shock lockout, it's safe to assume that integration into the controls of a Shimano Di2 setup is very likely. In the UK, there are going to be a total of nine complete Mach 5.5 Carbon builds, all of which will require the piggybank of an oligarch as they range in price from a staggering £9000 to a not exactly modest £4950. If you'd rather build it up yourself, then the price for a frame and Fox DPS Factory shock starts at £3300. There will be three basic bike specs, the Team, Pro and Race. All get a mixture of Maxxis DHF front and faster rolling Rekon rear tyre in 2.6” width, Fox Float Factory DPS EVOL rear shock and Fox Transfer dropper post, with the larger sizes getting a 150mm drop and others in 125mm. The very smallest XS frame gets a dinky, shorter travel KS Lev Integra post however. There's a top end Fox Factory 36 Factory fork with clever FIT4 damper on all models except for the base bike. The top end Team gets those fancy carbon Reynolds hoops amongst other finery and you can pick from Shimano XTR Di2 11spd in double ring or single ring, XTR mechanical with the same choices or the 12spd mechanical SRAM XX1 Eagle drivetrain, with prices descending gradually from nine grand in that order. Pro spec bikes get DT Swiss XM1700 wheels and a broadly similar spec, though the range starts with a SRAM X01 Eagle equipped bike, an XTR/XT mechanical 2x setup before the range starting XTR/XT 1x bike. The cheapest bike in the range is the Race model, which only comes with a mechanical, single ring Shimano XT drivetrain and Sun Ringle Duroc wheelset, plus some other cost saving measures such as an alloy bar and stem and a Fox Performance 36 with a more basic damper. Complete bikes will be in stock with Upgrade Bikes from the end of this month, though not all sizes will be available straight away. Jon's been riding bikes for ages and has been involved in the bike industry for most of his working life too, starting out as a Saturday boy at Harry Hall Cycles before moving into the world of media via the odd stint as a mountain bike guide. He's worked at Singletrack, headed up What Mountain Bike magazine and been tech ed at BikeRadar before arriving at the helm of road.cc's knobbly tyred sister site off-road.cc. He mostly rides mountain bikes up and down things as fast as possible (not always that fast to be honest) but isn't averse to riding drop bar bikes either, whether that's on gravel or tarmac. He goes all funny at the mention of rubber compounds and shim stacks.